William Lyon Homes spends all yearlong thinking about our homebuyers and how to build homes to meet their different tastes. As most of us discover each year, it’s not easy meeting the wants and needs of everyone on your list when gift-giving season rolls around. But the smart ones have learned to “plan ahead.” After all, you have friends and loved ones in several walks of life; they all have unique personalities and interests of their own; and one way or another, you find you’re always thinking of them. She said the builder is offering “A Home for the Holidays” sales promotion with special offers, incentives and move-in opportunities at its 13 new-home neighborhoods through Dec. 31. Prices range from the low $200,000s to more than $1 million. It starts with single-story homes in the golf-course community of Mountain Falls — Series I at Villa Serena and Series II at Tivoli. Series I at Villa Serena offers four floor plans as large as 2,102 square feet and priced from the mid-$100,000s. Series II at Tivoli steps up in luxury with four plans up to 2,741 square feet and priced from the low $200,000s. Both Mountain Falls neighborhoods offer a laid-back lifestyle with views of mountains, desert and golf course. The third all single-story neighborhood is Tierra Este. Priced from the low $200,000s, it’s in a quiet pocket of North Las Vegas and offers stylish architectural design. Homes range to 2,434 square feet with as many as five bedrooms and three-car garages. 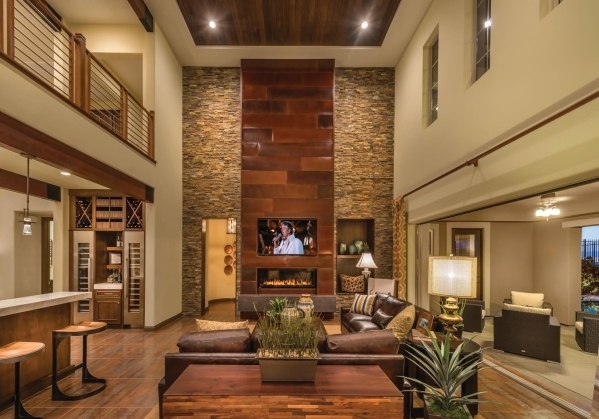 Lyon Estates — the 2014 Community of the Year — is in the northwest valley on spacious homesites with wide-open sky views. The recent addition of new floor plans raises the total to seven dramatic single-story designs priced from the low $400,000s — ranging from 2,639 to 4,440 square feet with as many as to five bedrooms and 4½ baths. Also in the northwest is the all-single-story community of Serenity Ridge — luxury homes up to 4,000 square feet that offer design features and flex spaces. Serenity Ridge includes as many as four-car garages and is priced from the high $400,000s. The feature-rich executive homes of Brookshire Heights and Brookshire Estates — two gated, sister communities — are in the southwest valley. Brookshire Heights offers a light contemporary look in three two-story designs. Featuring up to five bedrooms, 4½ baths and 3,178 square feet, along with standard three-car garages, prices are from the high $300,000s. Brookshire Estates brings four single-story designs with up to five bedrooms, 4½ baths, four-car garages and 4,199 square feet from the high $500,000s. William Lyon offers four communities within Summerlin: Allegra in The Paseos; and The Grand Collection, The Premier Collection and Silver Ridge within The Ridges at Summerlin. Only 87 homesites will be offered at Allegra in a gated community of three two-story floor plans as large as 3,323 square feet. These homes include several unique indoor/outdoor lifestyle features to be found on both levels of each home, with pricing from the low $500,000s. Models are due for completion this month and sales representatives are currently onsite. In the guard-gated community of The Ridges at Summerlin, visitors will discover the award-winning Premier and Grand Collections at Sterling Ridge, consisting of six luxury homes. Grand Collection homes are priced from the high $800,000s ranging as large as 4,180 square feet; while Premier Collection plans offer up to five bedrooms, 5½ baths and 4,871 square feet from the low $1 millions. At Silver Ridge, buyers can select from models at The Premier Collection, but have the ability to include up to a fifth-car garage and up to 4,893 square feet. The homes at Silver Ridge start from $1.28 million. The final two William Lyon neighborhoods offered are Tuscan Cliffs and Lago Vista. The guard-gated Tuscan Cliffs neighborhood is found in Southern Highlands, offering three two-story villa designs reminiscent of Mediterranean luxury. Ranging to nearly 5,000 square feet with up to six bedrooms, 6½ baths, and a sixth-car garage bay. Tuscan Cliffs prices begin from the low $700,000s. The crown jewel of Lago Vista is found in the oasis atmosphere of Lake Las Vegas — boasting a private beach with golf, mountain and lake views, along with exceptional design features in this collection of three two-story plans. These architectural achievements offer as much as 5,032 square feet and are priced from the high $800,000s. William Lyon’s three-year warranty and service program includes a 30-day, after-move-in check-up along with annual visits for the first three years to review general warranty service items; and 24/7 emergency on-call service. For more information, visit www.lyonhomes.com/nevada.